Fair enough, BSAArklay. But I feel the cartoony visuals of RE2 would feel out of place in a modern horror game with this kind of dark tone. We will always have the original, and I will always value it's unique quirks and style. @JC Wesker, the fedora actually comes from RE2 concept art. Im not happy either with the cartoonish character models, that just dont fit with the dark tone. Well...I was excited when this was announced, and now I am even more so. Almost everything I've seen suggests that they have done honour to the game, but have tastefully (and necessarily) tempered it in the interest of a "modern audience". As many have mentioned, the tone is the crucial thing. From the get-go, I suspected that the treatment of the soundtrack would likely reflect the character of the game, and the beautiful rendition of the Main Hall theme in gameplay footage helps to satisfy me that their intentions have been respectful and sincere, and that they are competent. The environments look wonderful! I'm just imagining now what the rest of the station, and beyond, will look like! Also, I'm very, very much looking forward to some deeper insight into Chief Irons, after his (my assumption) vocal appearance in the trailer: "Money's in my account; always a pleasure". I always loved the Outbreak series' expansive coverage of Raccoon City, and if the rumours are true that the game's scope is significantly increased, I'm just as excited for the new as I am for the old, because there's simply so much to excavate. The "over-the shoulder" issue isn't one for me, and if they offer fixed camera angles, that will exceed my expectations. While I enjoyed 7 (it was engaging and certainly well-made), it still wasn't, being different by type rather than degree. All that I've seen and read about the remake suggests a game that is faithful in every meaningful way to the original. Could not agree more with every word of the above post except for Survivalist's relaxation on the over-the-shoulder perspective, which for me has always offered nothing over the two options that it has always been a half-way house for, my prererrence of third person fixed camera, and first person utalised so well in Resident Evil 7; this middle road they've used for the remake serves only to block the screen! And it makes evading enemies on the run, cumbersome and clunky, a throw-back to the original Capcom were not going for. The newly added rain, and dark forboding lighting, immedialtely sets the right survival horror tone, reminiscent of the entering into the spencer mansion. I LOVE IT! The redesign of the front entrance hall resembles a real life working station more with the desk now brought forward. The lighting and grand staircase at the far end resembling the spencer mansion aesthetic and with the subtle changes to layout, it feels far more like a working station, and the atmospehre feels more forboding than the original. And how cool that the RPD main hall is actually the original layout, matching an early beta concept design?! But now the RPD has a new third floor! This extension makes me question even more so the need to make any drastic changes to the map of the ground & first floor from their iconic original layout. An example of this, which I hope to see utalised more, as an alternative to drastic map alterations from the original, is seen in the trailer with the very recognisable corridor outside of dark room save room, shot from a perspective that now shows an added 3rd floor. There is the recognisable, iconic bell sound when entering, but soon fades into an unrecognisable, and rather forgetful ambient drone, that soon fades out unlike the original which kept the music on a loop. (Deluxe version allows you to swap the soundtrack to the original game which is a wonderful bonus that should not have been a bonus!) Worryingly, there's not much music at all, noticably lacking in signature tracks for particualr locations. Instead there are just generic, ambient sounds. But tragedy averted when the Capcom USA stream did pick out the save room theme at one point. I am so relieved that much of the decour is faithful to the original, including areas directly pulled from original such as the corridor outside S.T.A.R.S office with the handcuffs tied to the railing, and the S.T.A.R.S conference room, although not seeing the back room with the 'A Sacrafice to the Hell Fire' painting. Also, so great to see the momentous shot of the first Likcer appearence, crawling across the RPD window, looking the most menacing it has the series - as do the zombies now; these secondary infectants have finally come of age, and for the first time in the series are as truly fearsome as the Hunters were from the start. I loved the gameplay mechanic that helps to slow the pace down by increasing the level of ammo it takes to finally kill a zombie. Considerably more ammo is needed and added to the stunning new zombie models, these really are the most fearsome zombies in the series. Coridoors kept faithfully slim thank god, possibly making it almost impossible to evade the zombies by running around. Also a great gameplay design that you can board up specific windows using planks of wood; another gamplay device from Outbreak. and a nod back to the original when you could close the shutters in one of two chosen corridor locations. Ada's and Claire's model look designed from the models of 1.5. and I am not overly keen on the almost manga, cutesy look to Claire. Claires look seems based on an early concept drawing of Elza Walker. The new face for Claire looks remarkably like Alyson Court, noticed & tweeted by Alyson! Very disappointed all reveal footage and demo is focused on Leon's campaign, relegating Claire to a supporting role in a game she should be sharing equal status. Interestingly, the demo footage inside the RPD played out a comparable gameplay scenario to that of the Ivy University section in Resident Evil 6. It was actually quite visually similar, with darkened corridors and a worryingly linear gameplay objective. Already appears more linear with step by step objectives, marked on your map, rather than the more open feeling of the original where Leon is wandering around aimlessly for survivors and Claire is looking for her brother. This really does concern me, and I hope it's just to ease inexperienced players into the game - becasue until Leon meets Marvin he has one specific objective, following what has to be a preset path to achieve it, the ennui of this alternative to a more open world, blind exploration that serves survival horror and Resident Evil games like Code Veronica & Dead Aim so well, is broken up by the necessity to remove obstacles, as also utalised in RE6. BUT the gameplay mechanic is nothing like RE6, with the RE engine from RE7 offering a stripped down HUD & inventory system that is a joy to use in comparison to the insanity in RE6. 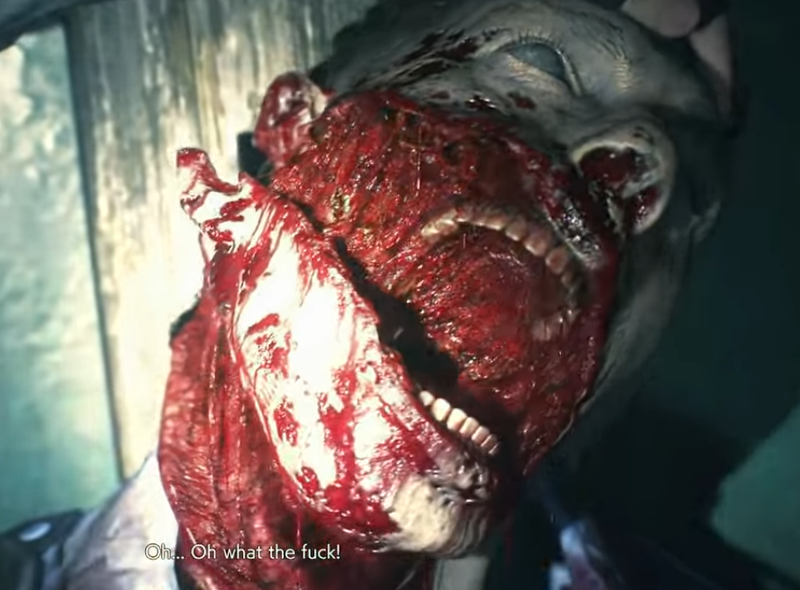 However, on the down side, again like RE7, there is a worrying lack of environment interaction, which in REmake added depth to the atmosphere & narrative, as player examination throws up interesting & forboding messages. The RPD is prime for these, if Capcom fail again to add them, it's unforgivable. From the cut-scenes we saw involving Marvin, and Elliot, the RE2 narrative is being expanded upon, fleshed out so minor characters only mentioned in files now appear in person. The dialogue between Leon & Marvin was written well, I liked their script which expands his role, and a strong performance from his VA. I am not happy that Marvin now fails to mention Chris and the other STARS members who infiltrated & survived the mansion, and the outbreak caused by Umbrella. Also Leon tells Marvin he was 'contacted a week ago and told to stay away.' That means he was warned one day before Hunk's mission took place accoding to the canon timeline but the new game sets Leon's first day in Raccoon City one day out from the original. Poor edits. So clearly this is more a reimagining than a remake, not designed as a replacement for RE2 - unlike the remake was for the original. We are being served an alternate RE2, where going on what we have seen in the demo, up to 70% is new additon, whilst 30% of the original is preserved. Compare that to the original RE1 v. REmake, which was 70/30 in favour of keeping consistency. But such a relief for me and an extremely positive sign, that despite these greater amount of edits and misisng familiar music, the RPD is STILL comfortingly recognisable. Capcom have altered things whose change does not actually effect the narrative significantly, such as dates files and Marvin not knowing anything about the mansion incident. This might just suggest those annoyingly frustrating changes have been very purposeful, Capcom mindful to emphasise a reimagining as a pose to a REmake. That really does set off alarm bells for me, because the developers of this remake are dealing with a very different builfding map to the one faced by those remaking the original RE1. The Spencer Mansion was a self-contained building, and so adding extra rooms was less jarring to the familiarity of the original. But this RE2 is more like a reimagining than a remake, with a very likely to be significantly edited RPD, albeit with the odd familiar iconic room added to appease the likes of me; but that wont be enough if the RPD & Raccoon City streets changes are so frequent as to be a disruptive step too far removed from the original. Posts: 136 ^As long as this "alternate RE2" is not a reboot, and is a part of the same universe as all following sequels, that's fine by me. Even RE1 wasn't nessesarily replaced, as no significant details have been removed, just added onto. The early games play very fast and loose with canon in regards to geography and the exact nature of specific scenerios. I like the idea of newer fans that discovered the series through RE7 playing this remake, exploring Raccoon City, learning about Birkin and the G-Virus, getting to know Claire, Sherry and Leon, and really just getting acquainted with the things that defintively made RE what it was in the first place, while not being put off by the controls or what have you. RE's canon got WAY too bloated, and if you ask me, getting away from everything that happened after RE4 was the best thing they could have possibly done, and now going back to RE2 just seems like it has so much potential to revitalize the series in a meaningful way, while retaining the elements that made it great in the first place. So here is this dead cop Leon looks at in the demo. Posts: 136 ^ Great observation. The wound definitely looks like he got a Licker Frence Kiss. You know more than most how supportive, defensive, and excited I was for this remake, and now having seen so many horriblely unnecessary contradictions, and OTT character models lacking the charm of the original, I am deeply worried and concerned now. I'm with the both of you here, to some degree. I am much more interested and excited about actually playing the game than i expected to be but the more changes I witness the more we all cringe. I've said it before but the community is going to have an interesting time in the weeks after the release arguing about what additions there are to canon, if any at all. Personally, I'm hoping we treat this as "alternate universe", as complex as that would be... it'd certainly be neater than discarding RE3 and both the Outbreak games et al. Why yes, I did. Facebook. Twitter. She's a soulless ghost, captain. I'm glad others are seeing it too. It remains too early for me to tell. So far I think the gameplay looks fantastic. I love the camera angle, controls look great, graphics are good and Zombies are scary again. However the story and changes seem a bit drastic to me. Ada among others look ridiculous although appearances never have really bothered me in the past and I can easily ignore that. Then there is the story changes such as Marvin's complete omission of STARS, etc, etc. The reason I have not made my mind up is because I need to digest the full story and see just how big these differences are. Could it just be placeholder dialogue not to spoil events of the game you never know. Unless Capcom surprises me however and everything comes full circle and the story actually fits/expands on the orignal then I probably will not enjoy the game simply because of the story and character representation. Same reasons I disliked 7. Another thing these two games have in common is that they both are decent games at least in terms of gameplay. If Remake 2 was not in fact Remake 2 and was Resident Evil 8 change the environments to say Dulvey, change the cast to new characters and link the story to Resident Evil 7 then I would probably love this game. I think in terms of everything but the story and character portrayls this is everything the series needs to progress with horror. So like Resident Evil 7 which I do not enjoy, unless I like the story and characters nothing else in the game matters to me. Which is a complete shame because everything else looks fantastic. Posts: 136 I don't see any plot holes so far, besides Claire meeting Kendo instead of Leon. Marvin's dialogue is taken out of context, and he specifically says "there are some theories", which implies he knows something. I'm actually shocked by the level of detail so far in the story, and the references to Outbreak and The Umbrella Chronicles are greatly appreciated. I certainly don't see why one would see it as "dismissing Outbreak and RE3". I say this all as someone initially sceptical with the project. I think Claire's VA sounds off, but the other portrayals are fine. Leon sounds inexperienced yet determined, Ada sounds aloof, Sherry sounds awkward (which may or may not be a good thing), and Irons is creepier than ever. No not so much plot holes...yet but certainly doesn't look good at least IMO. Like the STARS refference for example, it doesn't contradict anything however the original connected the dots much better by aknowledging what came before. It almost feels to me like they are going out of their way to ignore the Mansion Incident. Why not just aknowledge it? The only thing I can think of is they are afraid to make connections with other games because they don't want to harm the lore. Which kind of defeats the whole purpose of remaking the game at least in terms of story. Fans out there are looking for connections that at the time Capcom were unable to make due to plotlines not being established yet. I don't really have any problems with the voice acting aside from Irons who in some ways I like the new additions such as the character being more obviously sinister however the original Irons was a lot more stealthy and sly with his betrayal and if I had to pick one I think I would prefer the original. Posts: 14 Sure, a lot of it is people theorising. For example, Ada's reaction to Leon's question of "what's going on" sent me into frenzy. Something so minor but if her response truly is "it's classified" whilst walking off implies that she's not bothering to keep up her original pretense of looking for her boyfriend John. Moreover, file dates have changed and architecture has changed a tonne. The streets of Racoon City are vastly different which could change everything, and of course the RPD. I have to agree with Psyniac and that Ada "It's classified" line was just cringeworthy. Could she be anymore obvious? I don't know if that's her intention or not? But if not then it's pretty insulting, you have to admit ER that she look's like a generic spy. Envrionments have to change and I am ok with that so long as it doesn't contradict the story for example Ada and Leon/Irons and Sherry wandering around outside even though A/B scenario is never specific with it's events neither or them have this scenario. If anything it helps with one of ORC's major inconsistencies and allows the timeline for Delta hunting him to fit. I agree with you ER in terms of let's not jump to any conclussions here which I feel like you are saying? Let's wait and find out if the elements like the Mansion incident being mentioned plays out as you said. Which is why I am always back and forth with this particular title. I won't be able to come to a full conclussion until I have played the full game. But as of right now and initial impressions yeah I like the look of the game but the story has me concerned and always will until I make it to the credits. Posts: 14 For the record, whilst I have my concerns, I'm trying to not to leap to conclusions. These are more just musings on my end. I'm remaining positive about the whole thing, which is nice because I spent so many years against the idea of a remake. Posts: 136 I get the concerns, and yes, I'm saying let's not jump to conclusions in a sense. It's just that after hearing what the developers have said and the recent direction the series has taken (which I understand doesn't appeal to everyone like it does to me), I can't help but to be optimistic. I never imagined the RE2make would look this good. I didn't want a remake back when it was announced for a number of reasons, but in the end it looks like a passion project if ever there was one. Ada has a track record for wearing ridiculous outfits, and the coat at least makes sense in the raining environment. But like you, BSAArklay, the character appearances hardly bother me compared to others. Her line might mean she's still under the guise of an Umbrella researcher. It might also end up silly and nonsensical, of course, and I agree her being a spy isn't exactly subtle. It's totally understandable to be worried, I'm just offering up my own expectations and opinions. You guys are a lot fairer than many others, who freak out at the slightest changes and condemn the devs prematurely. Also, my comments weren't just directed at any one person - a number of people were talking about how it would mess up the original canon, and regardless of how it turns out I don't think it needs to take away anything from RE2 in our minds.